Biologist Brandon Keplinger (center) works with staff to restore trout populations. Photo courtesy W.Va. Dept. of Commerce. Biologists with the West Virginia Division of Natural Resources have released fingerling brook trout into a tributary of the Cacapon River with the help of students from Slanesville Elementary School, part of an effort to restore native trout to the Eastern Panhandle. The division initially stocked hatchery-raised trout, but they didn’t reproduce well, said Brandon Keplinger, a district fisheries biologist for the division. Biologists also tried moving adult trout from stream to stream, but this depleted the population of the donor stream and increased the chances of transferring harmful bacteria to the new stream, Keplinger said. The eggs and milt were taken from native brook trout nearby, after which the adults were returned to the water. 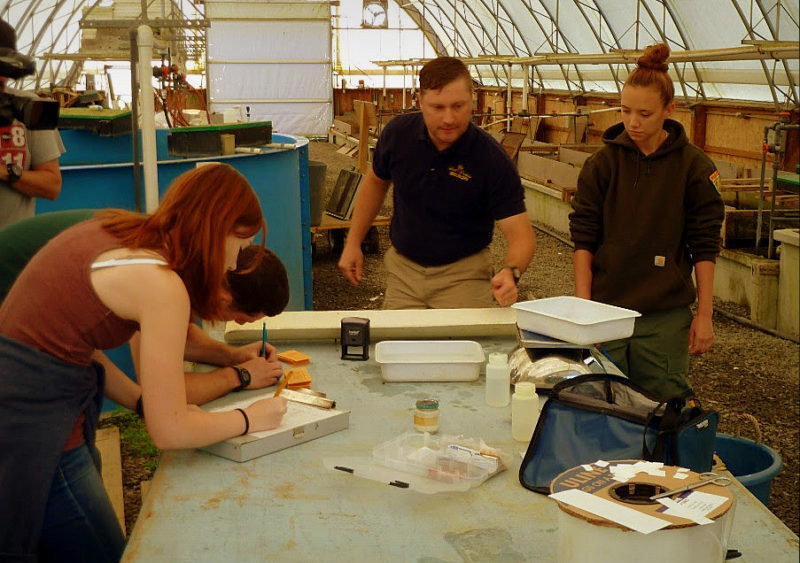 Biologists took the fertilized eggs to Reymann Farms, a facility near Wardensville affiliated with West Virginia University, where staff raised the young trout to fingerling size over several months. Stocking fingerling trout appears to have been successful, he said. “To get to this size, they’ve proven themselves to be pretty hardy, and they are more likely to survive high water flows. Keplinger said what division has learned from the process will be used next year so more trout can be raised for release in nearby streams with similar elevation, water temperature, and water quality. Previous articleFallout 76: Which West Virginia landmarks can you find?